Short hairstyles are one of the hottest trends at the moment. They are fun, easy to style and look really great. However, there comes a time, when you would probably want to grow it back. This can be a hard thing to do. It takes time and requires a lot of patience on your part. In this post, we will offer you some hair tips on how to properly care for your locks, so that they grow strong, thick and healthy, and how to style your hair while you’re growing it out. Among of the most important hair tips you’ll ever hear for growing out your hair is to use the right products. This can do wonders. Buy a mild shampoo, which keeps your hair’s natural oils intact. These oils protect your scalp, so that your hair will grow strong and healthy. Washing them out can cause breakage and split ends, which means you’ll need more maintenance trims, therefore it will take longer to reach the desired length. Also, try not to wash your hair every day, since this tends to dry it out. Two or three times a week is enough. The way you dry your hair can also have a big impact on how quickly it grows. When your hair is wet, gently squeeze the excess water and pat it dry with a towel, rather than rubbing it. Then, use a wide-toothed comb to brush out the tangles gently. Letting it air dry is the best thing you can do. But if you must blow dry your hair, use a product, which offers protection from the heat, and blow using the cold setting of your blow dryer. Our next hair tips for growing out strong and healthy locks are to use as less chemicals as possible. Commercial shampoos, conditioners and styling products may make your hair look great in the short term, but they contain harsh chemicals, which cause damage. Avoid shampoos with sulfates, conditioner and styling products with silicone and hair dye. When you start growing out your hair, in the awkward stages, hair accessories will become your best friend. Fortunately, headbands, beaded hair combs and embellished hair pins are quite trendy now. Experiment with different hairstyles to make the most of your current length. 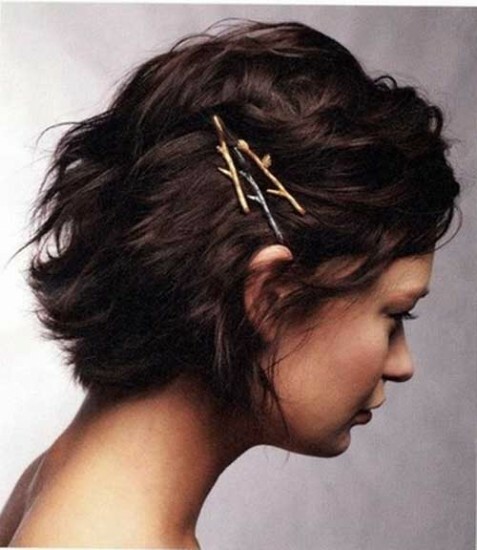 Fun and fashionable hair accessories can hold back the shorter pieces of hair, while looking stylish at the same time. Just stay away from rubber bands or accessories, which have Velcro on them. These can cause breakage. For the days, when you simply can’t style your hair, whatever you do, wear a hat. You can find one for pretty much any occasion. Follow these easy hair tips and grow out stronger, thicker and better looking locks than you had before you decided to chop them off. Now, while your hair is still short, it’s time to start gathering some inspiration from photos of hairstyles you like. You still have plenty of time to figure out what will work for your face shape and hair type.